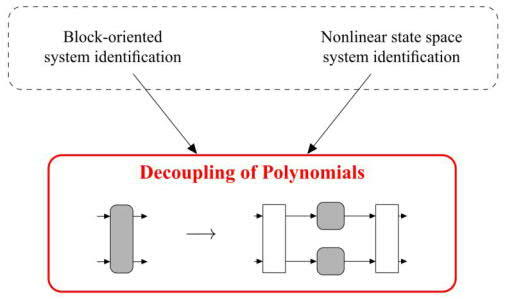 System identification is the art of building mathematical models from measurements. Today its focus is shifting from linear to nonlinear dynamical models to capture the nonlinear effects of the real world. However, the main issue with nonlinear models is the lack of intuitive and physical insight. A central task in block-oriented system identification and nonlinear state-space modeling is modeling nonlinear functions of several variables. We will develop methods to unravel a multivariate polynomial into univariate polynomials. Models can thus be given physical or intuitive interpretation and the number of parameters drastically decreases. We will study exact and approximate decompositions. The former provide a theoretical understanding of the decoupling task, whereas the latter are of interest for noisy data or when a parsimonious approximation is needed. • a function linearization approach translates the task into simultaneous matrix diagonalizations. This topic can accommodate up to 3 students and is flexible to be adjusted to their particular interest (right mix of theory and experiments). The ideal candidates have keen interest in linear algebra.